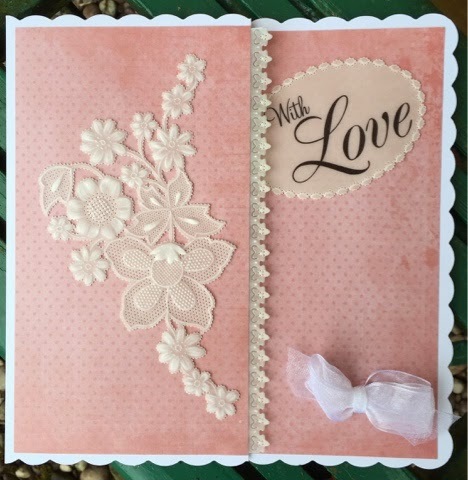 I wanted to share this card I made using one of my favourite paper kits - Picture Windows and Postcards and my Elegant Stems Stamp Set. 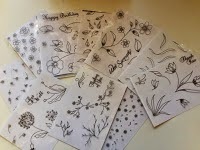 The Flower was traced onto parchment paper, embossed, perforated and snipped out. 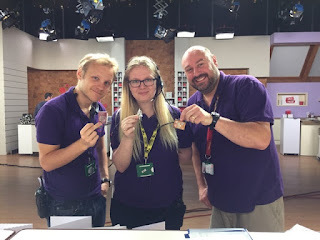 for my shows on Create and Craft, she has also been to the Studios meeting the Crew. Magic Hands - Matt, Georgina and Ben welcomed her. Sadly Flat Susan has to be on her way and I know she will enjoy her next port of call - Ali. 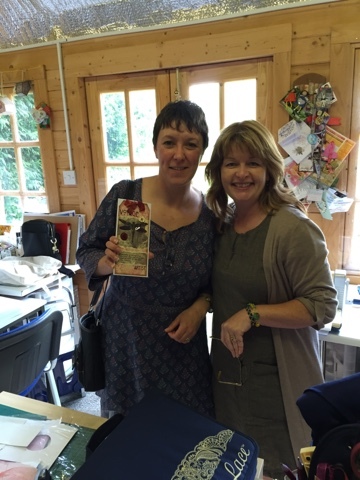 I hope you are enjoying Susan's Adventures, you can follow her here. Just a quick post to let you know that Flat Susan has arrived and will be spending some time with me. Jenny (Buttons) dropped her in to me along with a fabulous tag. I hope you will enjoy following her adventures with me. This is another card using my Elegant Stems stamp set on Parchment. 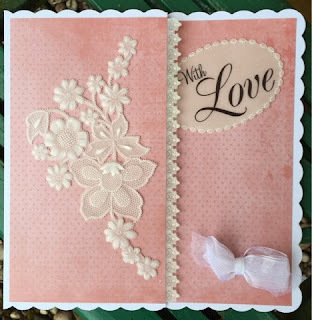 I traced the design, embossing on the reverse and created a border using my Parchment Masks, Circle tool, diagonal grid and semi-circle tool. 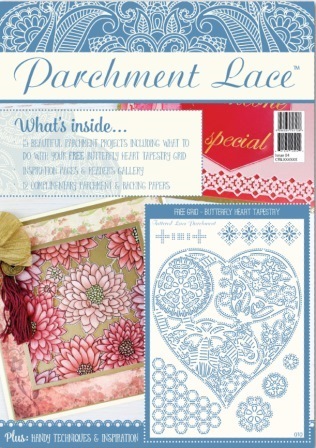 The dies, of course, are Tattered Lace as is the swirl embellishments and ribbons. Good Morning to you. 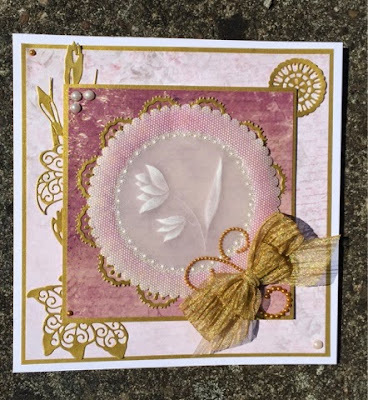 Here is a Parchment Card using another of my stamp sets, Elegant Stems. I have stamped the design onto copy paper and traced onto parchment with white Tinta Ink and a Mapping Pen prior to being embossed on the reverse. The border was created using a Circle Parchment Mask, Semi-Circle and Circle tools - perforating shallowly, embossing and perforating fully. 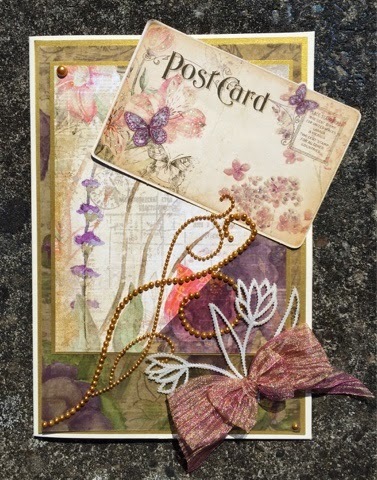 The butterfly was made using Pergamano Multigrid 31, coloured with Spectrum Noir pencils and glittered with Sticky Ink and My Craft Studio Ultra Fine Glitter. 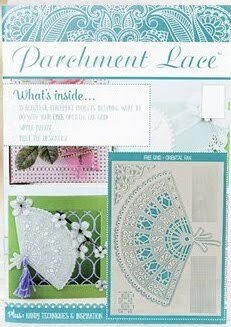 The die peeping out is Tattered Lace, Royal Lace, Victoria. Good Morning. 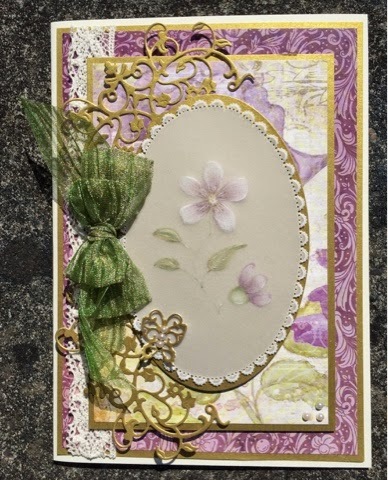 Today I am posting another Parchment card. 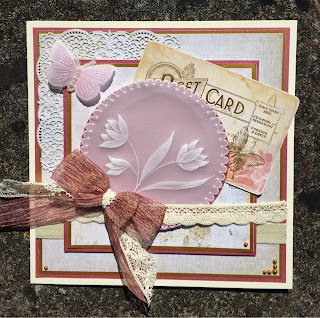 The design is an image traced from my own stamp range and coloured with Spectrum Noir Pencils on the front with just a little embossing on the reverse. For the border, I traced around one of my Parchment Masks and perforated with the Semi-Circle tool, re-perforating fully after embossing. 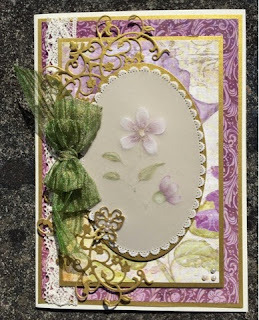 Here is a card, made using one of my own patterns on the My Craft Studio, Spring Blossom CD. 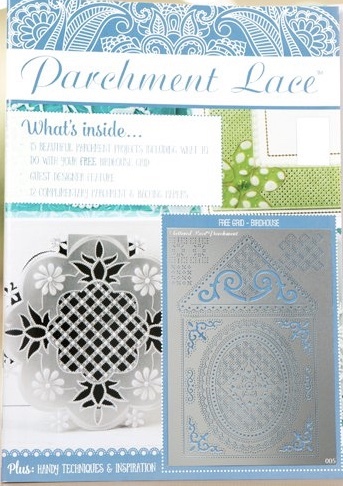 The flower Border is a Tattered Lace Border Die, especially for Parchment. 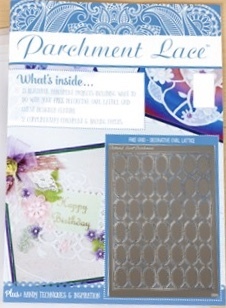 All supplies, including the Parchment Sentiment are available from Crafting.co.uk. I have a love of crafting which started when I was very young. I am so lucky to have always been encouraged by members of my family and friends. I am a freelance craft tutor, demonstrating on Create and Craft TV and I also run workshops on card making, beading, pergamano, sewing and anything else which is fun, creative and messy.